The family from Maine says they have been looking forward to Princess Cays which offers plenty of adventure and attractions. Or folks can just lean back in a beach chair and relax. The private 40-acre island area owned by Princess Cruise Line since 1992 is a fun stop on Princess cruises. Princess Cays is located in the Bahamas, in the southern portion of the island of Eleuthera, which was discovered by Christopher Columbus in 1492. The island is 100 miles long and about 2 miles wide. The island is graced with gently rolling hills and miles of sparkling white sand beaches and mangrove trees. Eleuthera is about 200 miles from where we set sail in Ft. Lauderdale, Florida. As with all shore stops, passengers can stay aboard the ship and enjoy a huge choice of shipboard activities or they can go ashore for even more things to do. On Princess Cays, activities include swimming at the private beach, renting water fun equipment, shopping at the island marketplace and dining at the complimentary barbecue lunch. Ships can’t dock here so Princess passengers have to take tenders from ship to shore and back. We will be anchored offshore only from 9:30 a.m. to 4:30 p.m. and it is not convenient to take the tender back and forth so passengers are packing what they need for a day on the island. Bars and drink stations are plentiful on Princess Cays and a large barbecue lunch will be served from 11:30 to 2 p.m. on the island. Grill choices are burgers, hot dogs, chicken and ribs with all the fixings. There’s also a big tropical fruit area if diners want to eat light in anticipation of dinner on the ship. Princess Cays is connected by a series of paved paths that lead to palm tree-dotted beaches where clamshells and private bungalows are available for rent. Bring water shoes, as the shoreline by the water can have sharp rocks and coral fragments. 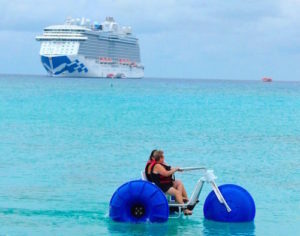 Unlike some other cruise line private islands, Princess offers excursions to nearby villages from Princess Cays. Although Princess uses a section of the island, the rest of Eleuthera is inhabited by a population of about 11,000 residents. On our day at Princess Cays, we saw a young couple get married on the beach. After exchanging vows, the wedding party posed for photos alongside the Caribbean. In their formal attire, the bride and groom and attendants jumped into the air numerous times so a photographer could try to capture the unusual photo. Next, the groomsmen tossed the groom into the air and caught him for more photos. Then they tossed the bride aloft, still holding her wedding bouquet and wearing her long white dress as she came down safely into waiting arms while the camera clicked away. The photos must have been pleasing because the wedding party gathered round the photographer, looked at the digital pictures in the camera and giggled. I imagine the newlyweds will have a fun photo album of Princess Cays to share when they return home.